Freezing strawberries can be a bit tricky since they contain so much moisture. Learn just how to freeze berries so they do not clump up or ice over in your freezer. Wash and core each berry removing any bag fruit and blemishes. Allow to air dry in a colander or on a paper towel. Place onto a foil lined sheet in a single layer. Freeze for 20-30 minutes. Place into dated and labeled freezer bags remove all of the air before sealing. Freeze and use within 1 year. In Northwestern Pennsylvania, June is one of my favorite months. It’s warm and sunny and the kids are on summer break. Oh yes, and it’s strawberry season! 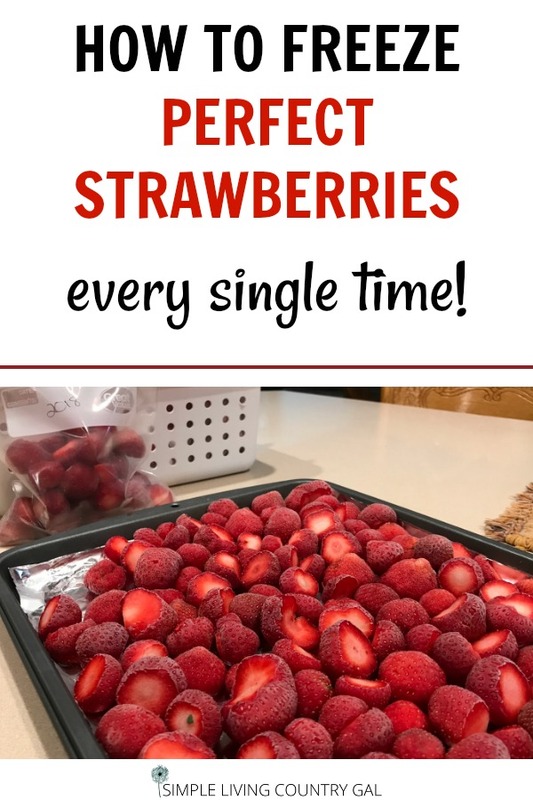 I just love strawberries and every year I look forward to strawberry season when I can fill my freezer with bags and bags full of these delicious berries. 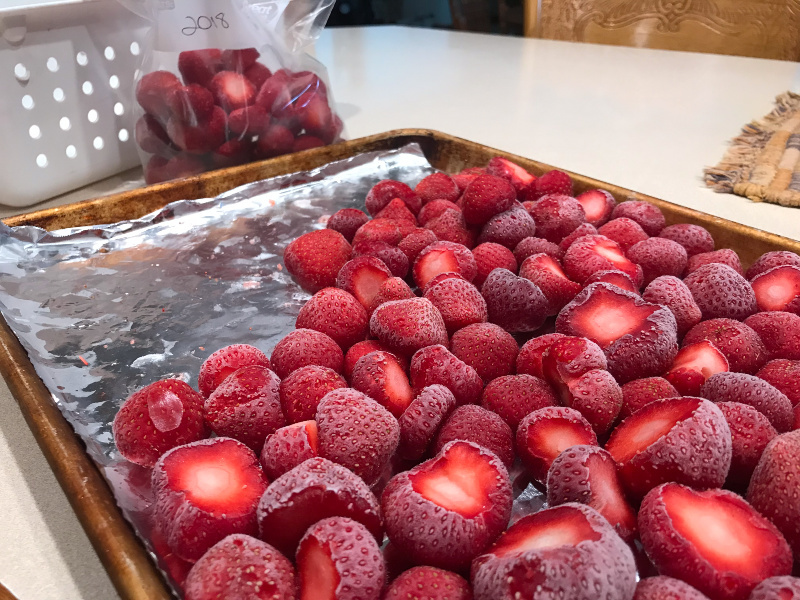 This post will show you how to freeze strawberries to ensure they taste amazing in smoothies and recipes all year long. If you are like me, summer is the time to fill your freezers and pantries with fresh wonderful summer foods to help see us through the winter. Self-sufficiency is all about staying out of the stores and living on what you have rather than buying what you need. This is much easier to do in the summertime since we have our gardens, farmers markets, and pick your own fields that are all in abundance with fruit and vegetables. But winter is a different story. Winter is slim pickings, my friend, especially up north. That is why it is so important to prepare for winter during the summer by picking, preserving, and stocking up. Blueberries, blackberries, raspberries, and strawberries all top the list of my favorites. Even though this article is just about how to freeze strawberries you can use this method with just about any berry out there. Freezing berries can be a bit tricky because of all the moisture they contain. 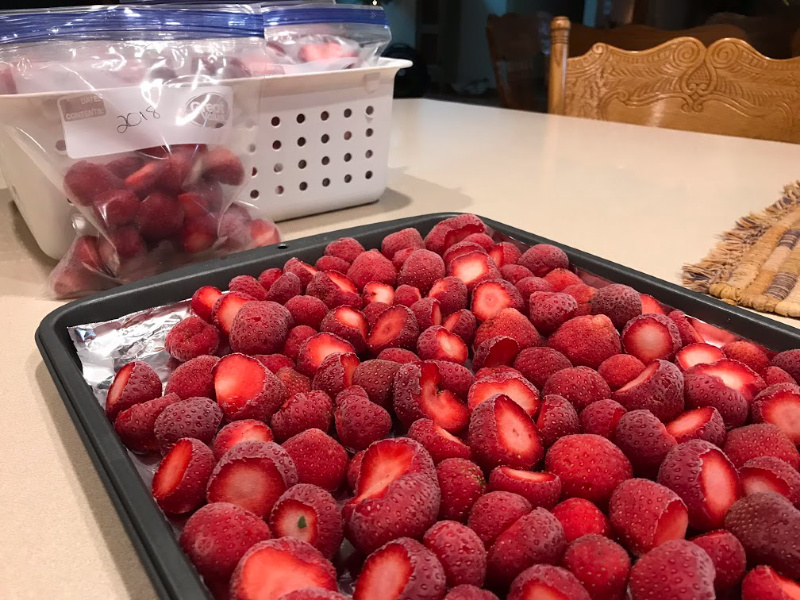 I used to come home from the fields with my berries, wash them up, remove the tops and put them directly into freezer bags. Well, actually no. Come winter when I went to get my berries for a recipe what I found was a clump of frozen fruit that I could not separate into the portions I needed. At times, I am embarrassed to say, I actually hammered my berries just to get a few to use in my smoothies. I can only imagine the condition of those strawberries from being bludgeoned all in the name of healthiness. Since then, I have learned just a few simple tricks that make freezing berries of any kind super easy. Step #1 . Choose only the best and freshest berries. I highly recommend growing your own berries. Nothing is better than knowing your fruit is definitely organic and if you grow berries yourself you will know the exact path your fruit took from start to finish. If you are like me, however, and are surrounded by “pick your own” fields this may be a better option for you. Ninja Tip: Before you visit a pick your own field, make a call to see what pesticides, if any, that they use. Always, ALWAYS try to go organic whenever possible. 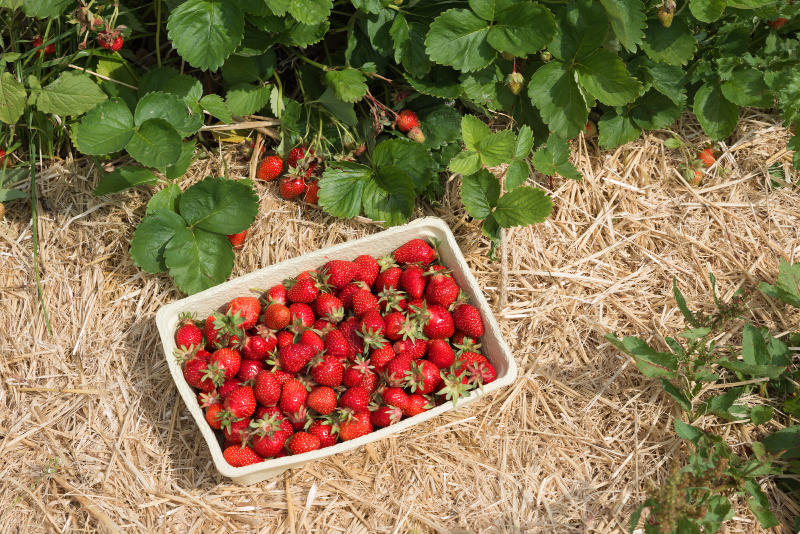 We only want to freeze strawberries that are organic if possible so do your research before you pick. Step #2 . Freeze the day you pick. When you freeze strawberries, this tip is super important. You want to get those berries at the peak of freshness. By freezing quickly you are locking in all those nutrients at their peak so you will enjoy the amazing health benefits even months later. For that reason, you will want to pick early in the morning so you have the rest of the day to do your prep and freeze work. Step #3 . Clean and prepare your berries. The most thorough way to do this is to wash each strawberry removing the top and checking for any blemishes. If you find any just simply cut out the blemish and freeze as usual. Ninja tip: Don’t toss your berry cuttings! Chickens and pigs love strawberries and your tops will be a lovely treat for them. No animals to enjoy? Then toss into your compost bin instead. Step #4 . Let your strawberries dry. After your berries are washed place them in a colander to drip dry for a bit. You can then place them on a layer of paper towels to allow them to dry a bit more. They do not need to be completely dry but you do want to make sure they are not dripping wet. The drier the fruit, the less chance you will have of icy clumps of berries. Step #5. Do a pre-freeze of your berries. This, my friend, is the berry freezing game changer! 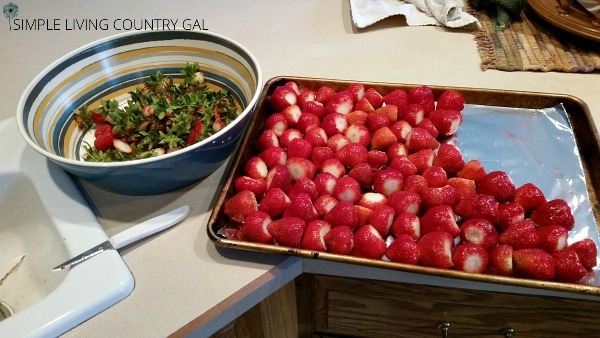 My best for you to freeze strawberries like a pro. After you have par dried your fruits place them on a foil-lined cookie sheet and place them in the freezer. This will ensure your berries stay separated once they are in freezer bags and that they do not freeze in big clumps. Step #6 . 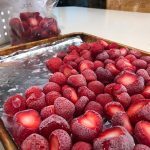 Put your frozen berries in freezer bags. After a couple of hours, your berries should be frozen. Remove the cookie sheets and place your desired portions into already labeled 1 quart freezer bags. I like to add about 2 cups to each bag so I know ahead of time just how much a bag contians for specific recipes when needed. Don’t forget to add a date so you know just when they were frozen. Step #7 . Freeze to enjoy later! Once your bags are full place them back into your freezer. Ninja Tip: Keep frozen fruits and vegetables together so you know where everything is when you need it. If you have a chest freezer that can be a bit tricky to do. These great freezer baskets are an amazingly simple way to organize a deep freezer so you can find things quickly and easily. There is nothing worse than losing food to freezer burn, and these baskets really help to keep things organized. You can find these baskets here. Yes, they are used for recyclables but they fit perfectly and stack well too. With the handles, you can easily pick up a full basket and see just what you have underneath. I just love these baskets, they keep a chest freezer completely neat and organized. Simple – easy – perfect! Please know that these berries will still be a bit mushy when thawed. There is simply no way to prevent that and. for that reason, it is best to use these berries for recipes rather than eating from the bag thawed. 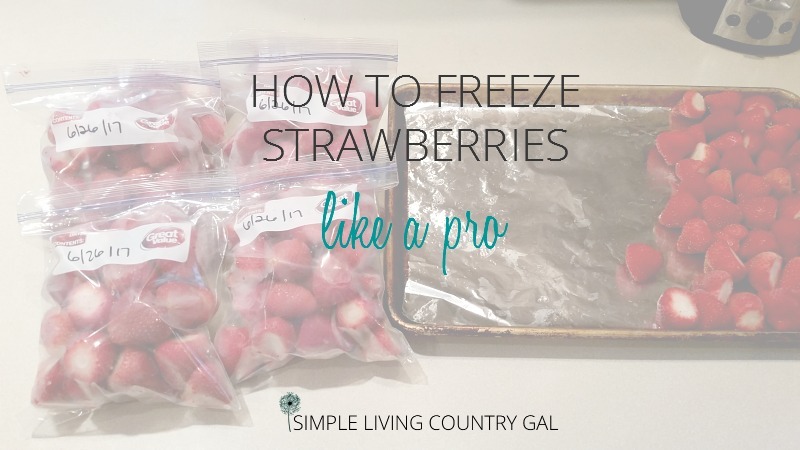 Now that you know how to freeze strawberries, let’s take those same tips and freeze even more produce. There is nothing better than enjoying a little bit of summer in the dead cold of winter. 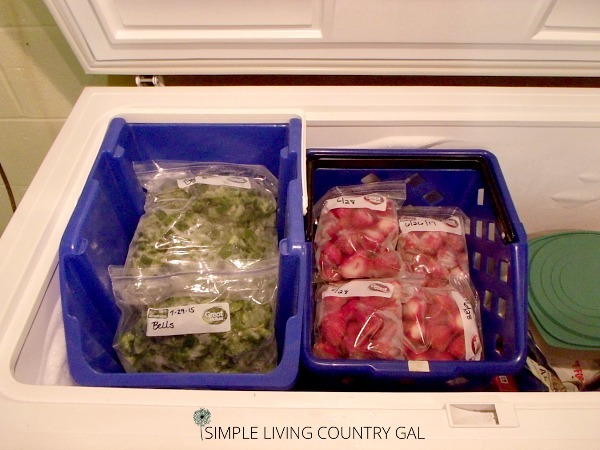 Once you learn how to freeze strawberries you can use this trick with other produce as well. The perfect way to preserve a huge, delicious harvest! Thanks for sharing on Homestead Blog Hop!